Finally a practical solution for laptop computers in vehicles. 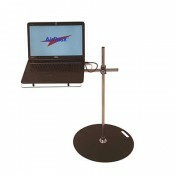 The AirDesk® ultra-adjustable laptop desk stand for cars and trucks requires no vehicle modifications. Installs in seconds in any vehicle, folds to store. 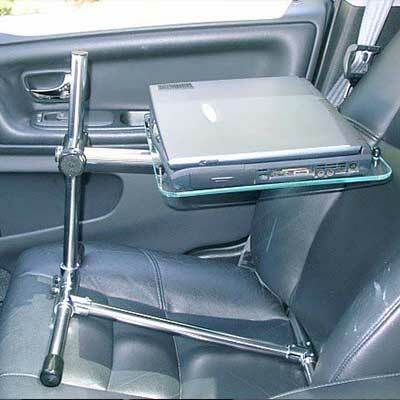 Turn your car or truck into a productive and ultra-comfortable work station! AirDesk's unique positioning technology puts your keyboard and screen exactly where you need them. Work in undreamed of computing comfort from any car. Installs in seconds in any car or truck's front seat or back seat. Dramatically increase your mobile efficiency and comfort with the new Mobile AirDesk. Turn your car or truck into a productive and ultra-comfortable work station, in seconds! 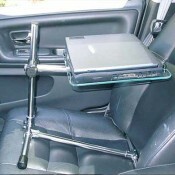 Finally a practical solution for laptop or tablet computers in vehicles. 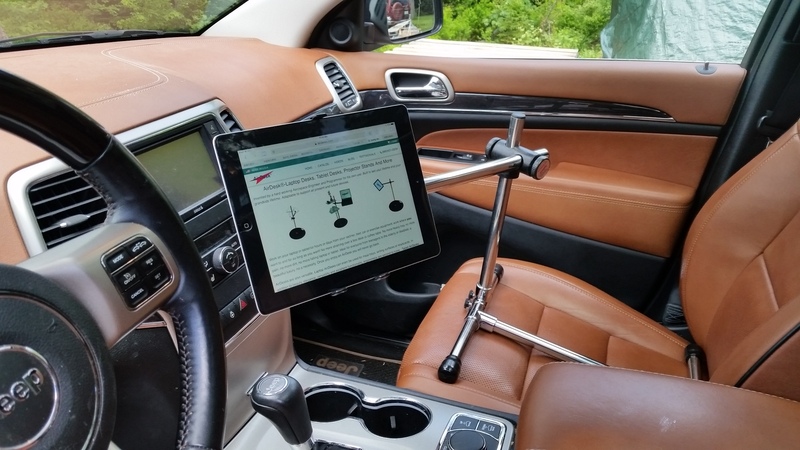 The AirDesk® ultra-adjustable laptop desk stand for cars and trucks requires no vehicle modifications. 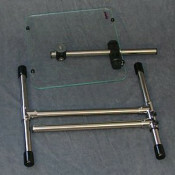 Installs in seconds in any vehicle, folds quickly to store or transport. With any laptop or tablet, turn your any vehicle into a productive and ultra-comfortable work station in seconds! AirDesk’s unique positioning technology puts your keyboard and screen exactly where you need them. Work in undreamed of computing comfort. Installs in seconds. Works with in any car or truck’s front seat or back seat. Dramatically increase your mobile efficiency and comfort with the new Mobile AirDesk. Used by fleets and ideal for anyone on the go. A great sales incentive or gift for your hard working mobile force. 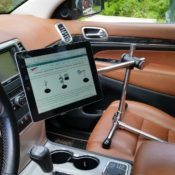 The patented seat mount allows you to securely install the Mobile AirDesk and any laptop or tablet to the front or back seat of your SUV, your company car, your luxury vehicle, compact car, pickup, minivan etc. It works with virtually ANY CAR. No hardware, no drilling. Installs in seconds, simply tilt the seat back, place the Mobile AirDesk on the passenger seat and tilt it upright again. The seatback clamps the frame securely between the seat cushions, simple as that. Works in any seat, absolutely no seat damage, only a secure, cushioned ride with excellent device positioning. 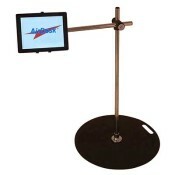 Take your client to lunch or pick-up your friends, no problem, the Mobile AirDesk is stored and set up in seconds. 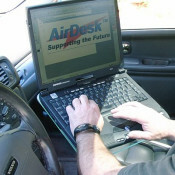 Change vehicles, no problem the same AirDesk fits any vehicle, car or truck. The unique design provides an extremely secure mount for your valuable laptop. 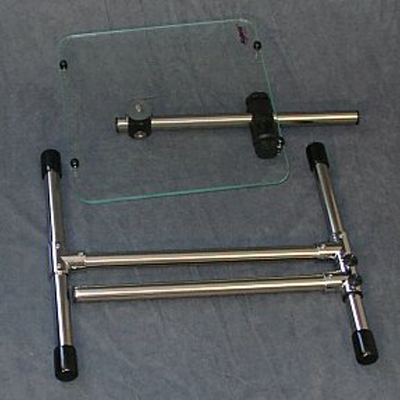 Your laptop is cradled between rubber posts in the front and back of the acrylic laptop tray and the whole assembly floats on the seat’s springs for a luxury ride for your valuable data. For extreme service, Velcro attachments are also included to lock your laptop to the tray. Treat your all important laptop to the best ride available. The AirDesk uses the seat cushion to dramatically dampen road vibration to protect your valuable and delicate hard drive. Conventional bolt in mounts are tough on the computers, not the AirDesk. Of course, NOT for driver use while driving. Vehicles: Any with a passenger seat. 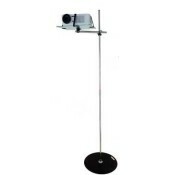 Frame size: 15" x 16” Mast height" 14” Frame and Arm: Mirror Polished Stainless Steel. Angle and tilt adjustments: Every. Direction adjustments: Every. Like the AirDesk computer tray, position your mouse next to your keyboard for comfort and convenience. Simply swing it away when not in use. 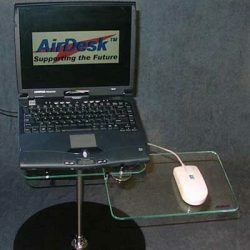 Fast Delivery on all AirDesk products! All items are in stock and ship within one business day. 99% of orders In by 3:00 PM Eastern Time ship the same business day. UPS Shipping options are: Next Day, 2 Day, 3 Day Select and Ground (least expensive). 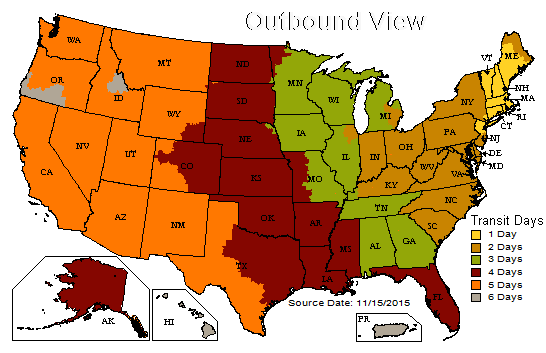 Check the map below for Time in Transit for Ground Shipping. You will be 100% satisfied by our products or return for full refund, excluding shipping, within 30 days. Email or call us first with your order number. You pay the shipping cost. In the event of a defective, broken or lost part, we will provide replacement parts and shipping at no charge up to 1 Year after the sale.